The goal of this project is to reduce the risk of flooding for houses and yards near Meredith Street in the Tarrytown neighborhood with an updated storm drain system. The project will also help improve water quality and erosion issues. The existing storm drain system, built in 1952, is undersized and discharges to an underground cave. The neighborhood has experienced flooding multiple times. Erosion and Safety: The stormwater is causing erosion within the cave, which could lead to portions of the cave ceiling collapsing as has happened in the past. It is reassuring that about 40 feet of rock provide a buffer between the top of the cave and the houses built over it. Reducing the stormwater entering the cave will reduce the rate of erosion and the risk of subsidence or settlement over the cave. Water Quality: Stormwater tends to be polluted with bacteria, fertilizers, pesticides, sediment and petroleum products. These pollutants are entering the cave system and potentially contaminating springs near Lake Austin. Any project will need to improve the water quality of the stormwater entering the cave by filtering out some of the pollutants. Flooding: The drainage capacity of the cave is not known, but is not sufficient to prevent flooding of houses nearby. 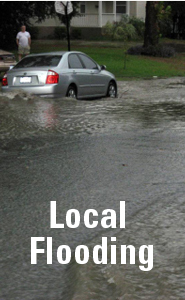 Several properties have experienced repeated flooding. The proposed storm drain system is in yellow on the map above. Green lines represent the existing storm drain pipes, and the pink shows the cave system. Click on the map to download a larger, printable pdf. Please email Stephanie Lott to receive project updates.